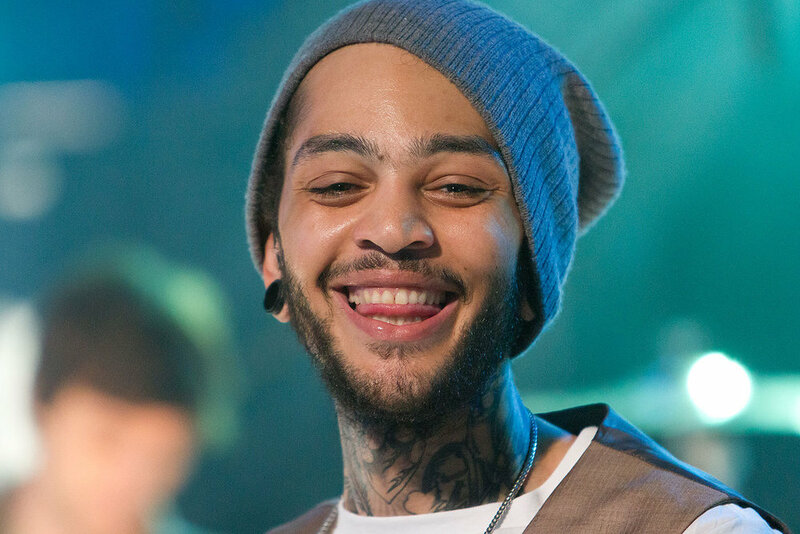 In 2010, Gym Class Heroes frontman Travie McCoy was riding high off the waves of his first solo endeavor, "Billionaire" — the infectiously catchy collaboration with Bruno Mars that was most likely stuck in your head that entire summer. But in the years since this mega-hit, the rapper seems to have largely disappeared from the spotlight. 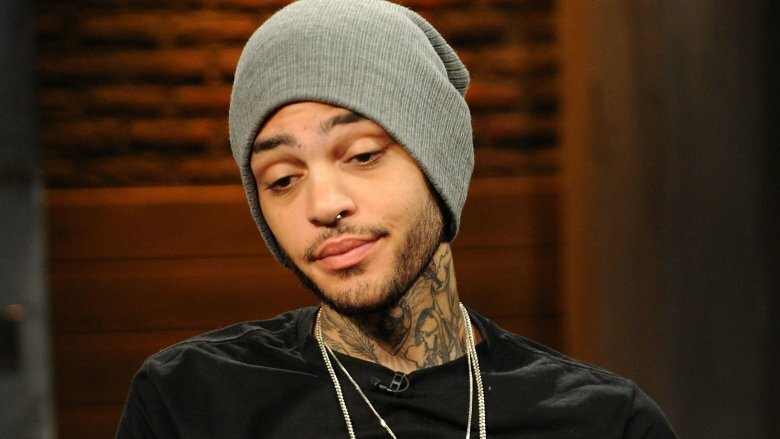 So, whatever happened to Travie McCoy? After the massive success of "Billionaire," which rose to #4 on the Billboard Hot 100 and was even covered on the popular Fox show Glee, it seemed like McCoy was well on his way to reigning the radio airwaves for years to come. But the rapper's follow-up singles could not match the success of his 2010 debut as a solo artist. "Need You" was released in October of that year. While it peaked at #36 on Billboard Pop Songs, it failed to land at all on the coveted Hot 100. His third single, "We'll Be Alright," fared even worse. Released in January 2011, it did not chart at all in the US. Despite the early success of its lead single, McCoy's debut album Lazarus did not make its mark in sales. Peaking at #25 on the Billboard 200, the June 2010 record only sold 15,000 copies in its first week. Both fans and critics had trouble separating the rapper from his band during his transition from Gym Class Heroes frontman to solo artist. "I'm trying to kill a lot of the negative connotations out there about me doing this solo project," McCoy told Billboard in April 2010. "A lot of people thought this was the end of the Gym Class Heroes…and I was trying to take the momentum we've built…and use it for my own selfish desires. That's not the case at all." It was "the longest, I think, I've spent on a record in my whole career," McCoy added, as he aimed to make it "a household object — and hopefully not a coaster." But the summer album would mark a drastic departure from his more serious Gym Class Heroes output. "You want music to have a good time to, music to connect to," he told MTV that March. "You wanna play it at the party." Despite his efforts, Lazarus received mixed reviews. While Rolling Stone praised McCoy for inventing "his own market by mixing emo, hip-hop and tween pop," the magazine only gave the album 2.5 stars, stating "his polished croon-rapping is more unctuous than charming." Katy Perry doesn't only write revenge songs about Taylor Swift, she's also taken pen to paper to hit back at her famous exes — including one Travie McCoy. As Nicki Swift previously reported, the frontman inspired "Circle the Drain" off of 2010's Teenage Dream, and the song's lyrics were anything but subtle. "You fall asleep during foreplay / 'Cause the pills you take are more your forte," Perry sang, in reference to McCoy's drug addiction. He had famously gone to rehab in 2008, when the two were still together. In October 2010, MTV ventured to ask McCoy about the musical diss. "I heard she put out a song that's about me, or about some old habits or whatever," he said. "[And] I look at it like this: I'm just stoked that she finally has a song with some substance on her record. Good job." Yikes! The rapper nearly followed suit when working on Lazarus. As he told Billboard, he had "scrapped a lot of the early material," because it was "kind of somber and a little too personal" following his "sh**ty breakup" with the pop star. But McCoy no long has any hard feelings. "For me to hold a grudge that long," he told Vibe in 2013, "I'd be a bitter son of a b**ch. I have a lot more interesting things to do than hold a grudge." He added, "I'm super proud of her." McCoy has long battled drug addiction. While he tried to kick the habit a few times, he finally became clean in 2013. The rapper opened up about his addiction to pharmaceuticals in 2017 on R.A. The Rugged Man Show. "I tore my ACL, MCL, meniscus; twisted all that sh*t up so I'm in the hospital all summer and they put me on OxyContin," he explained. "And they sent me home with a prescription full [of Oxy]….The first time I ran out, I got h*lla sick withdrawals." His doctor wanted to up his prescription, but McCoy decided to quit cold turkey. He was clean for a year before turning to the drugs again for recreational use. But with each pill costing $30, he eventually turned to heroine to get his fix. "That's why we have an [opioid] epidemic right now, you know what I'm saying? These kids are like, 'Oh, it's prescribed by a doctor, it's okay,' and it's not," he said. "These doctors are no different than dealers." McCoy's addiction quickly spiraled, and he became a "functioning addict." The rapper continued, "I've been clean for three and a half years, and it took literally me saying, 'I'm gonna f**king die.' I had to like talk to myself, like, 'Do you want to die?' And I was like, 'F**k, no!' And honestly, it was me having that conversation with myself and the birth of my niece, Farrah — my niece has been my reason [for staying clean]." In 2012, McCoy spoke candidly about his past on the Gym Class Heroes' episode of VH1's Behind the Music. But his honesty may have cost him some fans. "It was tough, honestly. At some point in my career, my life got put up for public consumption," he told Vibe the following year. "As far as opening up about my relationships or drug addiction, these are all things I've talked about in my music so, in a sense, it's already been out there; basically, A and C are already out there and that [show] was me putting B out there as well." "I got so many emails and people that have come up to me at shows to tell me that the episode helped them get through a turbulent relationship or addiction," McCoy continued. "At the end of the day, that was me subconsciously taking the spotlight I had and speaking on something that almost took me out in the hopes it would help other kids. It was worth it to me, whether I lost some fans or gained some fans from it." When pressed on this, the "Cookie Jar" rapper said, "You'd be surprise at some of the things people had to say. People, at the end of the day, are going to see things the way they want to see it. I do my best to avoid it, but sometimes it's like a car crash — you can't help but to look." After his solo career began to fizzle, McCoy brought the Gym Class Heroes out of hiatus to work on their fifth studio album, The Papercut Chronicles II. "All I got to say is it's definitely going back to the essence of Gym Class Heroes, which is four dudes sitting in a room, vibing off each other and making organic, dark metal," the frontman told MTV in 2009, when work on the record initially began. The album came out in November 2011 and peaked at #54 on the Billboard 200. But its lead single "Stereo Hearts" is what put hip hop/rock outfit back on the map. Featuring Adam Levine of Maroon 5, the song rose to #4 on the Billboard Hot 100 and #1 on Billboard Pop Songs. The popular hit was even covered on Glee, and was later certified 4X Platinum in the US. The group also found radio success with "A** Back Home," which featured English singer-songwriter Neon Hitch in October 2011, and "The Fighter," featuring vocals by OneRepublic's Ryan Tedder in May 2012. But the album itself was not a critical hit. Rolling Stone gave it a depressing 1.5 stars, calling The Papercut Chronicles II "the year's most charmless album," and named McCoy a "laughably inept MC." Harsh. When it comes to a reunion, Travie told Entertainment Tonight in 2015 “we're constantly working on Gym Class material. I think it's safe to say there'll be a new Gym Class album not long after this [solo] album." But the wait has been longer than originally anticipated. "When the time is right and I'm given the chance, we'll get together and start working on the next Gym Class album," McCoy told Billboard in 2014. The solo album was never released, neither was new music from the group.